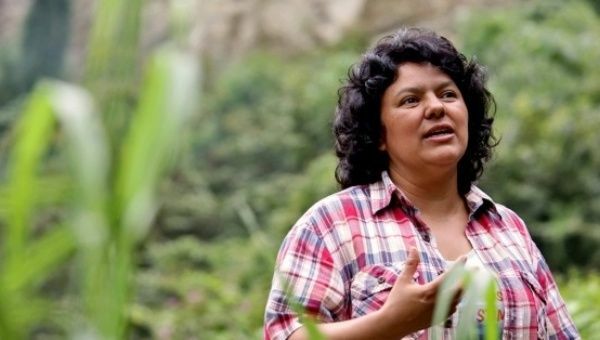 Honduran indigenous and environmental organizer Berta Cáceres has been assassinated on 3 March 2016 in her home. She was one of the leading organizers for indigenous land rights in Honduras. In 1993 she co-founded the National Council of Popular and Indigenous Organizations of Honduras (COPINH). For years the group faced a series of threats and repression. Mexican authorities have arrested and charged a local police chief in connection with the murder of the journalist and activist Marcos Hernández Bautista in the southern state of Oaxaca, among the latest reporters killed in the country. 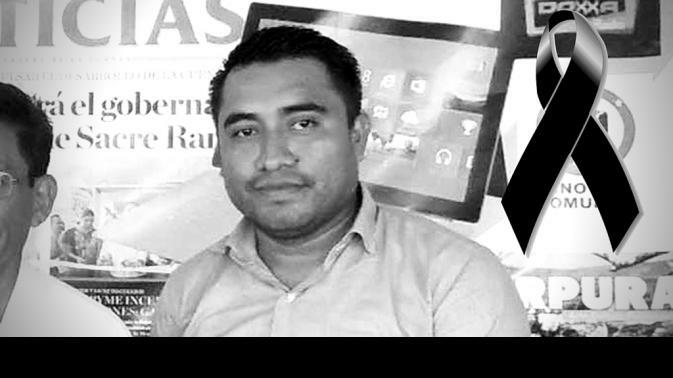 Marcos Hernandez Bautista, a 38-year-old correspondent for the newspaper “Noticias - Voz e Imagen de Oaxaca”, was shot dead in the Pacific coast village of San Andres Huaxpaltepec, district of Santiago Jamiltepec, Oaxaca on January 21. He also worked as the town's cultural advisor. In the community of Cerro de las Huertas, Ejutla de Crespo (Oaxaca) representatives of 48 communities and 30 social organizations participated on January 29 and 30 in the Conference of Communities and Organizations against Mining, in which they demand the state and federal governments for cancellation of all mining projects in Oaxaca. 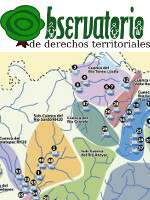 The goal, according to the “Colectivo Oaxaqueño en Defensa de los Territorios” and the organizing communities, was to create a space for reflection at the national level about the advancements and obstacles of the anti-mining movement in order to strengthen the resistance and defense of communities and organizations. 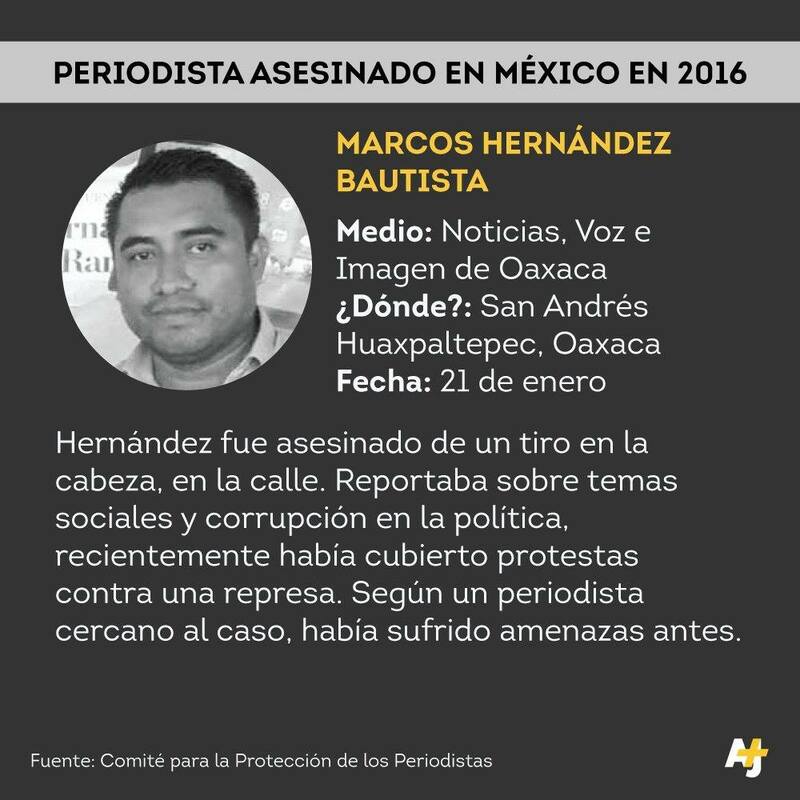 On January 21, 2016 another journalist was gunned down in Mexico recently, his name is Marcos Hernández Bautista, 38 years old, journalist from “Noticias - Voz e Imagen de Oaxaca”. Hernández Bautista was killed in San Andrés Huaxpaltepec, in the coastal district of Santiago Jamiltepec, Oaxaca. They found his body slumped by his car. He's the fifth journalist killed under Gabino Cué's term as governor. According to police forces, the communicator was killed instantly by a 9mm bullet in his head.